Situated close to some of Barcelona´s most famous attractions, including Plaça Espanya, the Fira de Barcelona, Montjuïc and the Nou Camp, , the Sants district is a top choice for your trip to Barcelona. One of the Catalan capital´s quieter areas, Sants is home to parks, shops and some of the best restaurants in Barcelona. By choosing the Sants district, via the transport hub at Sants Train Station, visitors will enjoy easy access to all of Barcelona´s endless landmarks while avoiding the hustle and bustle of the city center. This beautiful one-bedroom apartment in Barcelona is sure to welcome guests upon arrival, with carefully selected furniture adding to the warm and comfy feel of this charming home-away-from-home. The living room has a comfortable sofa, and a TV, making it a great spot to kick back after a day on the town. And for those who need to stay in touch with friends and family back home, an Internet connection is also available. The fully equipped kitchen allows visitors to create their favorite meals, or even try their hand at Mediterranean inspired cooking, all of which can be enjoyed on the balcony! Soak up the Spanish sun as you enjoy a glass of wine with your meal! The apartment has one bathroom fitted with a bathtub/shower. This charming apartment situated in the Sants district of Barcelona is a great choice for those who wish to make the most of the Catalan capital, all year round! The neighbourhood of Sants is one of the most emblematic in Barcelona. It was once a small, independent town until the expansion of Barcelona, when it was annexed in 1897. 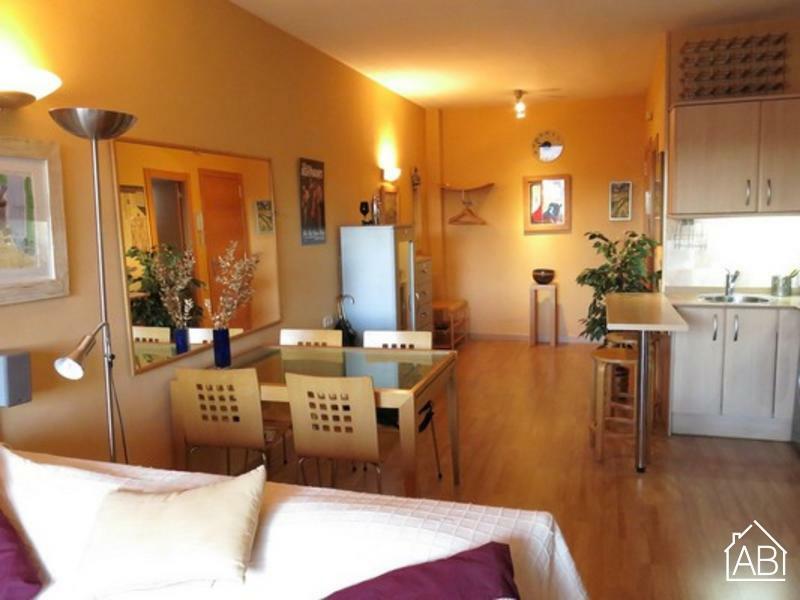 Today, Sants is a residential area with plenty of parks, shops, and restaurants. The main street, Carrer de Sants, is one of Barcelona´s biggest commercial avenues, where you can find many shops, markets, and great places for a bite to eat. Choosing to rent an apartment in Sants allows you to immerse yourself among the locals of Barcelona, as tourists do not tend to frequent this area often in comparison with the towns of the inner city. However, Sants is still close to many of the major Barcelona attractions, particularly Plaça d´Espanya and Montjuïc, and you can reach Barcelona´s city centre within minutes by metro. Also in the Sants neighbourhood, you will find the Barcelona-Sants Estació train station. From here you can connect easily to all of Barcelona, the El-Prat airport and plenty of the suburbs of the city like Sitges and Tarragona.